This week felt somewhat like an hangover from the hectic events of the previous week. The chaos in which the OPEC meeting of the 4th ended only produced its full effect this Monday, with another collapse in petroleum prices. The Brent index resisted for a few days, but would eventually break under 40 $/b, to close the week at 37 $/b. The media warns in unison of an impeding financial disaster with the energy industry; but so far banks keep feeding money to a large numbers of companies that are essentially dead. How will this all unfold is hard to tell at this moment, but some sort of bailout is more than likely - possibly through the banks themselves. Meanwhile, the whole "peak is here" talk is back once again in the wake of a small decline in the global production of liquid agricultural products. In what fossil liquids - petroleums - are concerned, extraction is still growing strong; even though hard data for the last quarter is not yet there, preliminary assessments point to something very close to 81 Mb/d by now. From the summer of 2014 until now world petroleum extraction grew 5 Mb/d, more than it grew the whole decade before that. However, I recognise 37 $/b will leave their mark. The petroleum industry is essentially shutting down, and even with Iraq and Iran replacing the coming extraction collapse in North America, the decline will eventually set in. It might become already visible in late 2016, but will be certainly marked in 2017 and 2018. Will that be the much dread "peak oil"? Far too early to tell. Oil production from Opec countries accelerated in November as an increase in Iraqi output offset a decline from Saudi Arabia, contributing to a steep drop in prices. The producer group’s monthly oil market report on Thursday said output increased to 31.7m barrels a day last month, up from 31.5m b/d the previous month, according to secondary sources who track member output. The data indicate Opec continues to produce far more than its former production target of 30m b/d, which it abandoned last week after a meeting of ministers in Vienna. While OPEC grows, North America declines. The data is starting to show a clear downward trend, that for the US at least will be hard to revert. Petroleum prices have been under the average marginal cost of US "shale oil" over an year, but only now the decline sets in. This delay in the supply destruction process is quite relevant. There is pretty much nowhere to hide from the debt built up by the energy industry. In the following 5 years the industry needs to refinance about 500 G€ in bonds - compare that to the 150 G€ Lehman Brothers had in their portfolio in 2008. This profound about-face has global consequences for the various commodities’ markets. In fact, Moody’s noted that the oil and gas, and metals and mining, sectors sold almost $2 trillion in bonds since 2010. All told, those commodities represent 14 percent of Moody’s non-financial corporate ratings, but contributed 36 percent of downgrade totals through October and represent 48 percent of defaults. “The sheer volume of commodity-related debt poses challenges because it means that credit losses from commodities investments will be substantial for many investors,” Moody’s said in the report. While banks and investment funds keep burning money with the energy industry, companies are being automatically forced to revise their declared reserves. Regarding this subject, recall this press review from October of 2014. [...] Time is up, prices are down, and the rule is about to wipe out billions of barrels of shale drillers’ reserves. The reckoning is coming in the next few months, when the companies report 2015 figures. 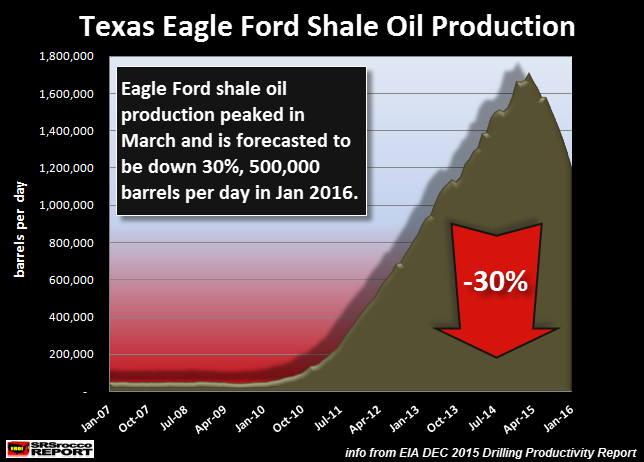 Here is another term for the US shale industry: "zombies". There is about a new one every other week. Though there is no single definition of a zombie, most investors and analysts consulted by Reuters say they tend to have exceptionally high debt loads and face the prospect of shrinking oil reserves. And here we get to the big numbers pointing to a peak in the short term. Particularly in what concerns exploration, the petroleum industry is grinding to an halt. While the global market is currently oversupplied with crude, Rystad Energy research shows that investment decisions for only 8 billion barrels were made in 2015, even though the oil industry needs to replace 34 billion barrels of crude every year. This amount is less than 25 percent of what the market requires long-term. Rystad Energy numbers show that prior to the post OPEC meeting oil price decline, the number of jobs in the oil service industry was already cut by 16 percent for the top 50 oil service companies. These oil service companies had aggregated revenues of $300 billion and 950,000 employees in 2014. To date, 150,000 employees have been laid off from these 50 companies alone, and an estimated 250,000 oil service employees from the top 400 oil service companies have been fired globally. Global exploration and production spending declined by 20 percent in 2015 and is expected to fall another 11 percent in 2016, marking the first consecutive annual decline since the mid-1980s, according to Evercore ISI’s Global 2016 E&P Spending Outlook. Rystad Energy forecasts spending to reduce by a further 70 billion next year and has warned that additional spending cuts in 2016 could occur following the current post-OPEC meeting oil price slide. Another remarkable announcement is the possible retirement of Shell from New Zealand. Naturally, these are not the best days to invest on off-shore resources. Royal Dutch Shell is weighing an exit from New Zealand as it continues its drive to shed US$30bn in assets globally and simplify operations as oil prices plunge. Shell’s review of its entire business, after a century of operations in the country, marks a blow to New Zealand’s ambitions of becoming a world leader in oil and gas exploration. Rob Jager, chairman of Shell New Zealand, said the review was in keeping with the company’s strategy to become a simpler, more profitable and resilient company. Shell-owned ventures account for around half of New Zealand’s total natural gas production and a significant proportion of the country’s condensate, or light oil, production. Coming now to geo-political news, Italy at least seems unwilling to automatically renew economic sanctions on Russia. The mainstream press hardly referred to this development. Italy unexpectedly demanded that a mooted extension of the European Union's economic sanctions on Russia go for further discussion within the bloc rather than be rubber-stamped by EU envoys who met on Wednesday. The envoys aimed to approve a six-month extension to the sanctions, imposed on Moscow last year over the Ukraine crisis, without discussion after an agreement by EU leaders - including Italian Prime Minister Matteo Renzi - in the wings of the Group of 20 summit in Turkey last month. But diplomats in Brussels said Rome was unhappy about Wednesday's plan for ambassadors to wave through the extension as a minor point in the day's meetings. "We have asked for a discussion on the matter," said Tiziana d'Angelo, a spokeswoman for the Italian mission to the EU. After trying to pick a war with Russia, Turkey has now shifted hostilities towards Iraq and Iran. The mainstream media was not shy reporting what looks like an invasion of Iraq by over one hundred Turkish military. However, hardly anything is being reported on the increasing aversion Baghdad is showing towards the US-lead coalition. The Security and Defense Committee of the Iraqi Parliament has called for a review or cancellation of an agreement with the United States on security over Washington’s lack of a clear reaction to the worsening situation in the country, committee member Hamid al-Mutlaq told Sputnik on Wednesday. “The government and parliament need to review the agreement signed with the United States on security because the United States does not seriously care about its fulfillment. We demand that it be annulled,” al-Mutlaq said. Remarkable news from Iran. The continued ascension of moderate figures to power in Iran can only be regarded as a good thing - perhaps except by Israel and the Sunni states. Hassan Khomeini, the moderate grandson of the founder of the 1979 Islamic Revolution, has decided to enter politics — a potential gamechanger in the already volatile power struggle to shape the future of Iran. Mr Khomeini, a 43-year old cleric and football fan who is popular with young people, will next February run for the Experts Assembly, the body likely to determine who the next supreme leader will be. He will be the first member of the family of the late Ayatollah Ruhollah Khomeini to be involved directly in politics since the 1979 uprising. The alternative energy note highlights Nuclear again this week. While this technology is clearly in demise in Europe, the story can be quite different elsewhere. [...] Moniz said "small modular reactors" (SMR) - smaller versions of the light water reactors that are in operation in most nuclear plants worldwide - can be a solution to the industry's financing problems. With capacities of 50 to 200 megawatts they are up to 30 times smaller than the typical third-generation nuclear reactors built today, which have capacities between 1000 and 1600 MW. [...] Moniz said he expects the first SMR concepts will apply to the U.S. Nuclear Regulatory Commission for design certification next year. "Assuming that goes smoothly, we are talking 2022-2023 as a credible time for having some of those built," he said. "The only thing that makes us both Americans is the rule book." That is a remarkable sentence from one of the most dramatic scenes of a picture I had the opportunity to watch this week: Bridge of Spies. In essence this is a picture about principles, how being faithful to them is capital in standing up against those that threaten us. A most contemporary theme.